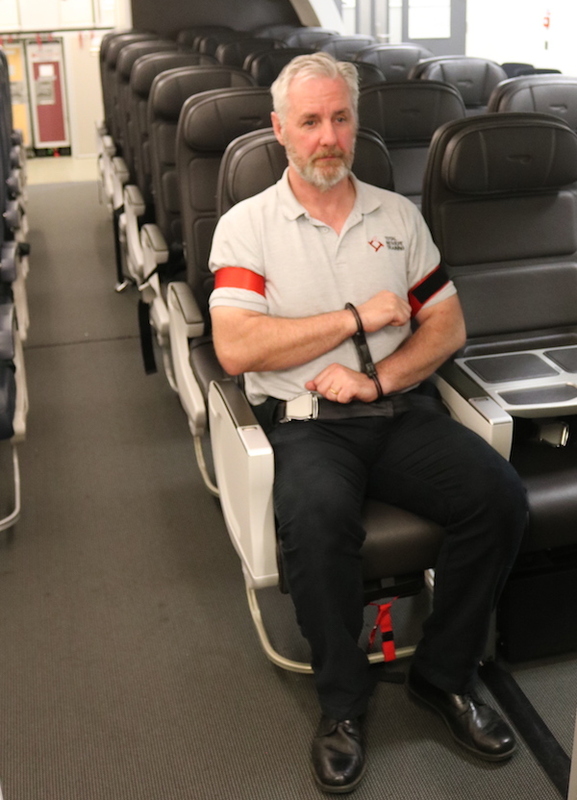 A workplace conflict consultancy in Britain has developed a passenger restraint system which will be easier for crew to use while reducing the risk of injury to passengers. The International Air Travel Association (IATA) reported last December that, while incidents of unruly passenger behavior were fewer than in previous years, the number of violent incidents had risen. Total Resolve, a crisis training and de-escalation consultancy founded by former police officers, designed the new restraint to address the needs of British Airways, following input from the airline about the complexity of using previous restraints. 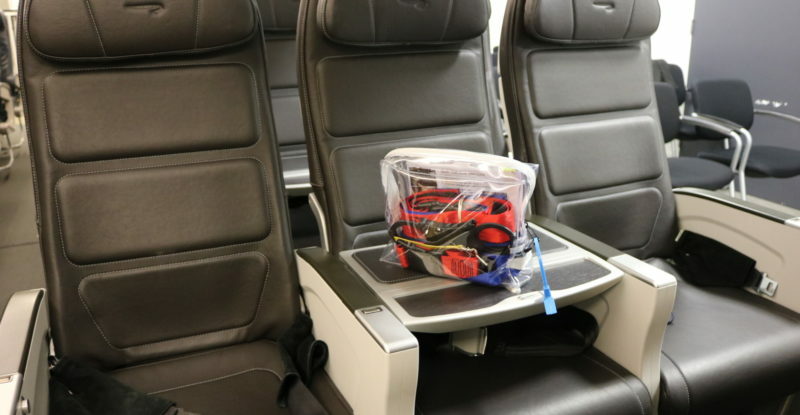 Runway Girl Network spoke with Tony Morgan and Richard J. Strickland, founders of Total Resolve, to hear their views on the rise and risks of managing violent passenger behavior. The causes are many, they tell us, from excessive alcohol or drug consumption, to mental health issues and issues of air rage. Morgan explains there are no easy answers. Airlines take different approaches to unruly passengers, from hands-off policies which rely on diverting flights, to airlines which issue tasers to crew to handle security on board. Either of these extremes introduces risk, Morgan and Strickland say. “The issue we have with [relying on diversions] is that it will still take at least 30 minutes with a violent person on board to deal with it. And they are unrestrained,” Strickland says. 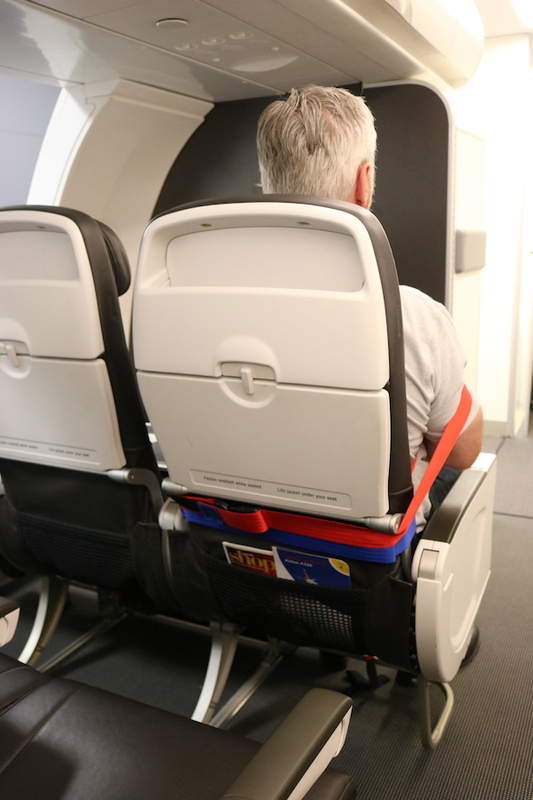 British Airways will first launch the new Total Resolve Quick Restraint System on longhaul flights, when diverting a flight to deal with a passenger incident is not an option. Morgan and Strickland also point out that crew and passengers who volunteer to help open themselves up to potential liabilities, especially with more extreme measures, like having using duct tape to bind passengers to their seats, tasering passengers, or having larger passengers intervene to defend crew. 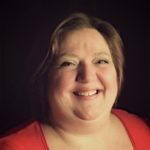 “We have found that sometimes, with the best intention in the world, they introduce issues where if the individual who is being restrained dies or is injured,” Strickland says. 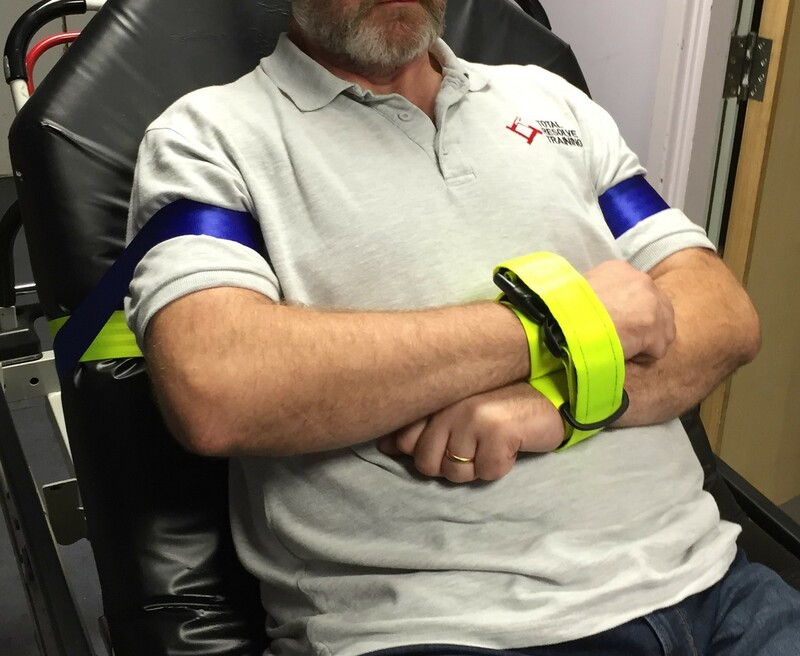 The Quick Strap System is designed to reduce potential injuries. “Our device doesn’t go around the chest. It only goes around the arm. It doesn’t form a tourniquet,” Morgan explains. 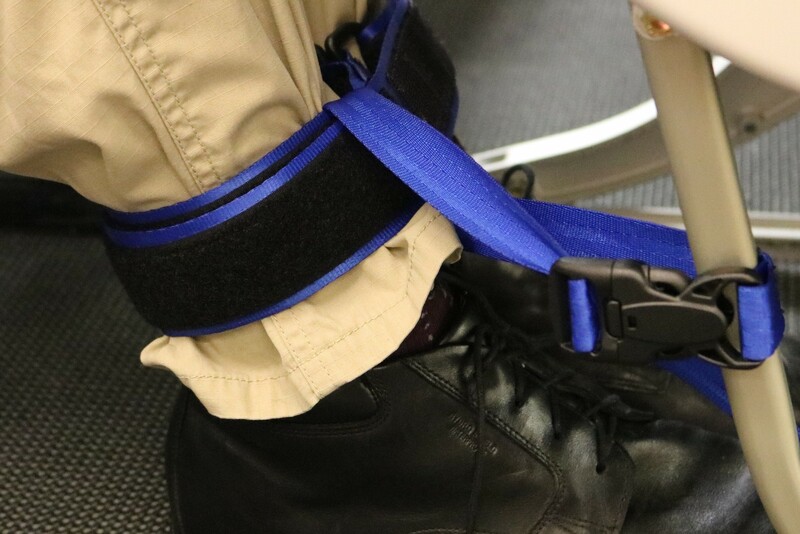 In some cases, crew may use separate ankle restraints developed by Total Resolve which can be fastened to seats, to keep passengers from kicking or getting up. Morgan and Strickland believe fixed handcuffs, of the type used by police in Britain, can be effective as a first resort to manage violent passengers. They say plastic zip-ties are more likely to cause injury and are too difficult to put on to be effective. They have also designed soft handcuffs, made of similar webbing to that used on seat belts, which can be put on quickly but will not injure the wrists or cut off blood flow. But the ultimate resource is training, Strickland and Morgan say, starting with training for de-escalation of conflict and teaching crew how to break away from passengers who become physically aggressive. I am very interested in the new restraint sytem. Could you provide more detail info about the system for me. For example, the size, weigh and time to train cabin crew to use the system. one more important issue is the price of the system. Allow me to introduce Starlux-airlines, this is newly established airlines based in Taiwan. The maiden flight will be Jan, 2020, flight route will cover Southeast Asia, in its first stage . I am in charge of aviation security, working in airline industry for 10 years and more than 30 years in law enforcement. Aviation security daily operation and crew member security training is my important job. Hopefulluy the new restaint system can be introduced to Starlux. Many thanks for your comment. We will message you direct with all of the details you have requested.